For many of us, August signals the tail end of summer and back-to-school is right around the corner. You might be in the middle of five different projects, organizing your household or still on vacation! Anything goes, and so you’ll find a little bit of everything in today’s blog post that I’m sew thankful for. This is the perfect time to start thinking about Christmas with Pat Sloan’s Merry & Bright Sew Along. Sign up to get weekly notifications of each new block tutorial as they are released. 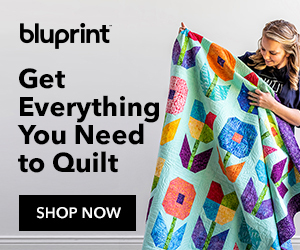 By the time the holidays are here, you’ll have yourself a beautiful quilt! Back again this year is another new quilt along from Melissa at Happy Quilting. The Seeing Stars Quilt Along starts on August 6 and continues through October 16 with prizes along the way as you sew up this beautiful 80″ x 80″ quilt. You’re going to love this Scrappy Nine-patch Stars Baby Quilt Tutorial from Amy at Diary of a Quilter. This 40″ x 52″ quilt is a nice size and can made with scraps or a variety of 2 1/2″ wide strips along with coordinating fabrics. Since I collect mini charm packs of 2 1/2″ squares, I SO appreciate this Mini Falling Charm Table Runner Tutorial by Connie at Free Motion by the River. One mini charm pack will make a small size runner, but if you have more you can make it bigger! I love peaking into other people’s sewing spaces. With that in mind, make sure to following Cherry at Cherry Blossoms Quilting Studio and Tammy at Tamarinis for the Creative Spaces Blog Hop. You’ll find 16 designers sharing tons of ideas and inspiration for your creative space. A little applique mixed with a little embroidery is what you’ll get with this Sweet Mason Jar Vase Hoop Embroidery Project by Bev at Flamingo Toes. She includes a link to a great tutorial for those woven roses. Very sweet indeed! You’ll love this Drawstring Bag with a Divider for holding your nail polish (or something else) by Pam at Threading My Way. This is a great way to wrap a gift and make it extra special. It’s time to start thinking about the holidays and to help us out is Stephanie at Swoodson Says with 13 Christmas Projects To Start Sewing Early. There’s a little bit of everything in this round up, so you can start checking off that “to make” list. I’m excited to announce that The Modern Plus Sampler Quilt Along has just begun and it’s being hosted by Cheryl at Meadow Mist Designs and Paige at Quilted Blooms This QAL will run from July 2018 until April 2019 with a set of directions revealed the first Thursday of every month. I love this design! I love this free Pelican Quilt Block Tutorial by Lorna at Sew Fresh Quilts. Lorna has quite the zoo menagerie at her blog and you’ll love all of her patterns and tutorials. Thanks for spending a little time with me today and for visiting all of these amazing bloggers and designers. I know they appreciate your support, too. Have a wonderful day full of inspiration and creativity! Laptop, I can manage the bulk & weight better. Well yesterday i celebrated a bday with my family ) and just now reading this on my lunch and i i feel SO STRESSED OUT- everything is SEW cute and i want to make! I am planning on the Seeing Stars QAL and just followed Melissa on Instagram! I’m gong to have to finish reading at home as my lunch is over…so i can map out a plan…. 🙂 🙂 Thanks for sharing!! Thanks for including my nail polish bag, Julie. Looking at Flamingo Toes’ mason jar makes me want to take up embroidery again – haven’t done any for years. So many fun projects in blogland! Julie, thank you for sharing the Modern Plus Sampler QAL! Oh my goodness Julie – you fit in so much. I love your ‘Pay it forward’ posts and seeing all your wonderful makes. Hello Julie: Wowsers, quilters are sure busy doing so many interesting projects and you help to make each one a project to chose to definitely click on and see all of the details! I enjoy seeing what other quilters are doing even if I do not participate. It always gives me a boost of inspiration. Thank you for sharing and have a marvelous day! Thanks for sharing my post, Julie!